*Reduced registration is a match of funds as a sponsorship from the CA MTSS SUMS Initiative. • Certified trainer for the International Institute for Restorative Practices. • Recipient of the Orange County Violence Prevention Coalition’s Ambassador of Peace Award. • Developed the Resilient Mindful Learner Project • Trained at UCLA’S Mindfulness Awareness Research Center, UC Irvine’s Samueli Center for Integrative Medicine, Harvard Medical School’s Benson-Henry Institute for Mind-Body Medicine in their School-based Stress Management Initiative. Unmitigated stress impacts the mind-body health of both students and educators. For students, stress is the enemy of learning and impacts their ability to focus, remember, pay attention, and manage their behavior. For educators, unmanaged stress can lead to emotional fatigue, burnout; and impact relationships and job performance. 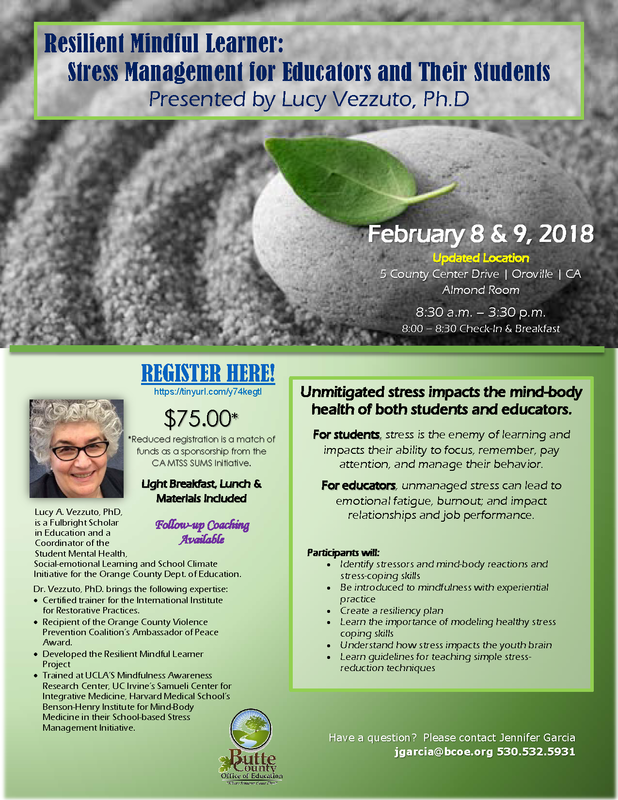 Lucy A. Vezzuto, PhD, is a Fulbright Scholar in Education and a Coordinator of the Student Mental Health, Social-emotional Learning and School Climate Initiative for the Orange County Dept. of Education.